One of the many popular buzz-terms within the cloud computing industry is application modernization. This refers to the process of updating and optimizing applications in order to support the latest technologies and digital initiatives. However, there are still quite a few businesses that opt for a traditional IT-centric approach to application modernization, seeing it instead as a function of Dev Ops where the purpose is to re-purpose or consolidate legacy software. At VEXXHOST, we take the approach that technology should follow and enforce your goals, not the other way around. Intelligent organizations know that the real promise of application modernization is delivering differentiated business value to your company and your clients by changing the application environment for improved, agility, interoperability, scalability, and efficiency. These businesses also know that application modernization isn’t a one step process but a continuous journey. The majority of companies struggle to maintain the in-house resources required to properly develop and carry out a full application modernization initiative. The method usually results in a mix of expensive strategy consultants, who neglect the maintenance of current systems in order to push through digital agendas. You need a trusted, unbiased partner that is able to not only deliver unparalleled cloud experience that focuses on your desired outcomes but is also able to deliver application modernization through a vast offering of managed services. With the help of a dedicated partner, your business is alleviated of the stress of identifying and integrating the newest technologies, as well as the managment of your IT environment. VEXXHOST takes the needs of our customers very seriously, which is why we place such importance on determining and understanding their goals before ever talking about technology. As mentioned above, VEXXHOST begins with discussing and determining the needs of our clients and their customers, in addition to how we can better their experience. As a result of prioritizing the customer, businesses can in turn pin point very specific end goals. 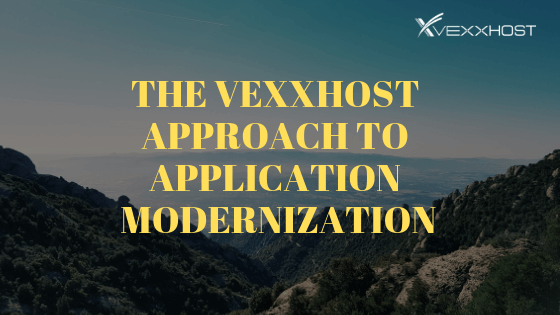 However, to reach those goals, VEXXHOST can help ensure that your application modernization efforts are part of the larger digital transformation, updating your company’s operational model to gain greater effectiveness. As your consultants and partners, VEXXHOST will help you identify which applications aren’t delivering on your business objectives and formulate a plan to eliminate technical debt. Once the goals have been laid out and the applications have been defined, VEXXHOST is able to turn our focus towards the technology that will best enable your company’s transformation. For example, which infrastructure platforms would make the most sense for certain applications and what applications would function best as a service for better integration and insight? To get the most out of your applications, choosing a provider like VEXXHOST can make all the difference. Contact us today to get started!